1. I can't believe its Thursday already ... and just two more weeks until Thanksgiving. We have so much going on that week as a family that I started prepping for the big T day. It looks like we will have about 20 guests, some overnight, so prepping early is a big thing for me. We have already divided up the menu ... so at this point table settings and an agenda is all I can tackle. I scored these amazing burlap chargers at Hobby Lobby for $2.99 each. I bought 6 and then immediately returned the next day for the remainder of what I would need. They are good!!! and will mix well for a variety of different seasons. I can already envision them with gingham for summer! and this is for the study. I knew that table size desk I have was a good plan! It will be seating six on the big day! 2. I am absolutely dying over Emily Clark's fabric covered walls in the girls room. Dying!!! My plan was to wallpaper Little Bits bathroom, but this may be a thriftier plan and I am thinking some contrast grosgrain ribbon with white studs would be perfect!! 3. Parker Kennedy Living just finished their covered veranda for the Atlanta Homes & Lifestyles holiday show house. Of course, I have seen the space ... but they haven't released the full set of pictures since the house doesn't open for another week. There are some great sneak peeks on their blog ... which you must go read!! I am freaking out over the use of blue and white and all the magnolia! It's beyond good!! These boys can ROCK a show house! 4, The completed master bathroom is a week old and she's still just as amazing as ever! I am beyond humbled and excited to see snip its of the room on so many blogs and feeds. 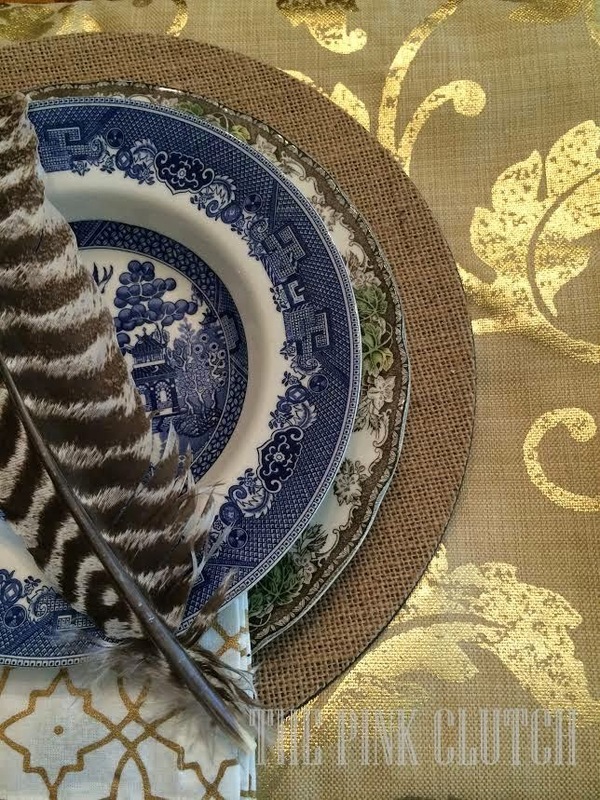 Thank you to Linda from Calling it Home for your feature, Jennifer from The Pink Pagoda for your amazing comments and including me in Blue and White Monday, 11 Magnolia Lane for the sweet review and Sherry from Design Indulgence for including me in your room review! Y'all know how to make a girl feel like she just won the lottery!! 5. Do y'all know Natalie Chang? Get to know her quick and you can thank me later!! She is one amazing talent and the kindest person I know. 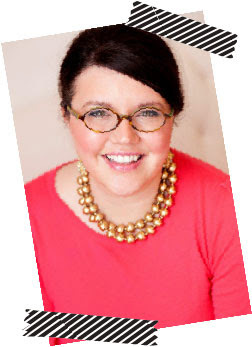 She is best known for two things ... her calligraphy and the designer of Lifeguard Press showrooms. She is the bomb.com and I am lucky to call her a dear and trusted friend! Her new Etsy store is helping me navigate my need for teacher happies ... having just received napkins and cups for Thanksgiving! And yes, that is her handwriting!! 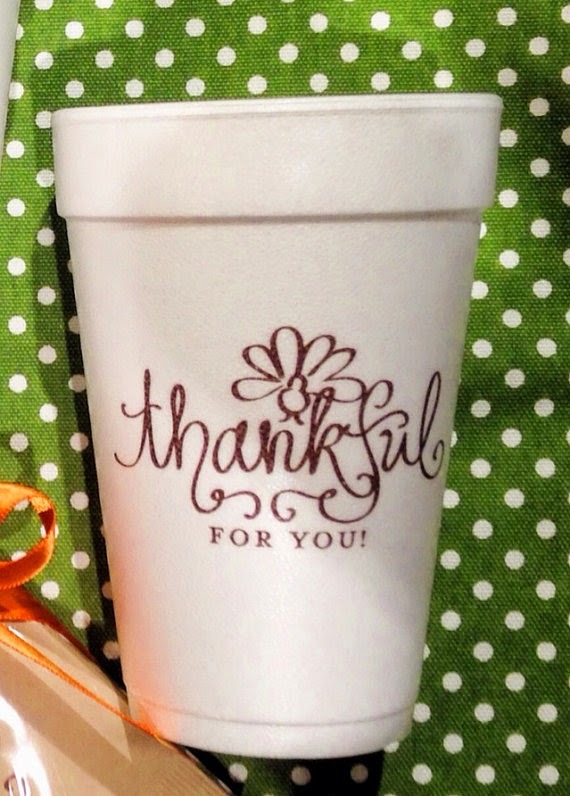 I just love how precious they are and I am so excited to use our cups for the many guests we have coming for T day. And those darling brown napkins ... I got four sets. One for me and three for Little Bit's teachers to send it with a note to show them how much we love and adore them! MUAH girl!! Love you to pieces!! 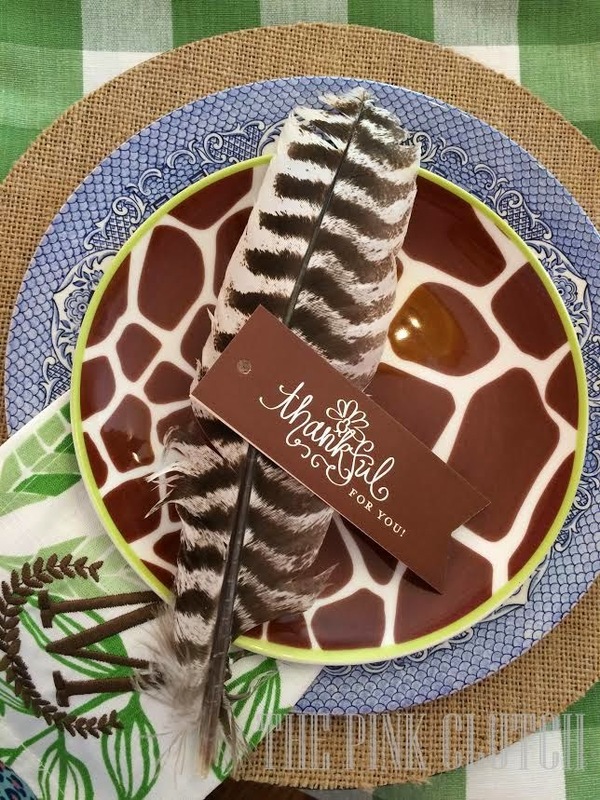 Love your table settings!! Great color combos. And yes, love Emily's newly "wallpapered" room. But, I do wonder how it would hold up in a bathroom with moisture. 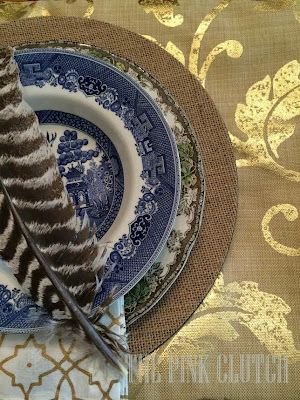 Praying I find time to visit the show house...sneak peaks are amazing. And lastly...love those napkins and the verse! Have a blessed weekend my friend. I am off once again to Texas. 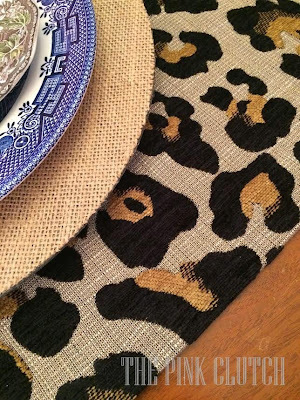 Love those burlap chargers--great find. I do love the cups and napkins.